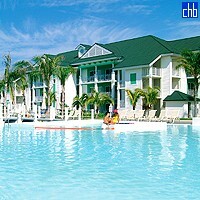 5 Star Hotel Meila Peninsula Varadero is located in Varadero, one of the most beautiful beaches in Cuba. 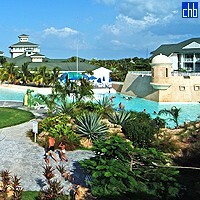 Meila Peninsula Varadero is recommended for families, events and incentives. 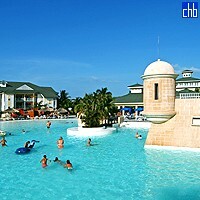 Also it is an ideal destination for a wedding or a romantic honeymoon in a heavenly tropical paradise. Melia Peninsula Hotel looks very impressively: good architecture, fantastic, beautiful, well-manicured, tropical gardens amongst the small 2 storey bedroom blocks that are well positioned for privacy. 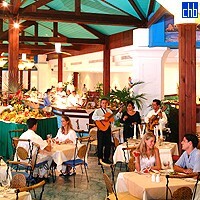 Hotel Peninsula Varadero is just right on the beach – white sand, turquoise water. One of the best beaches in the world! Facilities of Melia Peninsula Varadero include a few restaurants serving national and international cuisine, several bars, swimming pool with section for kids, gym, sauna, spa. Here you can book various excursions and practice different kinds of sport. International Diving Centre is nearby, which makes this hotel an attractive option for diver enthusiasts. The Family Junior Suite at Hotel Melia Pensinsula Varadero are designed for families and they can accommodate up to 5 adults + 1 child. 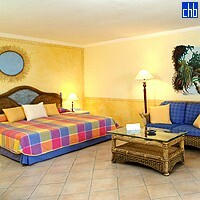 There are in total 10 Family Junior Suites and they are located close to the children's pool. These spacious and comfortable rooms have two bedrooms, one of which is equipped with a single bed and bunk beds and the other with one king-size or double bed, two fully-fitted bathrooms with bath and shower, umbrellas, coffee machine, living and dining area, telephone, air conditioning, LCD TV, stocked minibar, hairdryer, safe, CD player, iron and ironing board. Melia Penisula Varadero Resort means happiness for families!